Here is a look at the top 5 growing urban landscape design trends businesses are going green over. Plants are amazing! They are beautiful and calming as they absorb carbon dioxide and produce oxygen. As more businesses are discovering the benefits of providing outdoor spaces, several different trends have emerged. 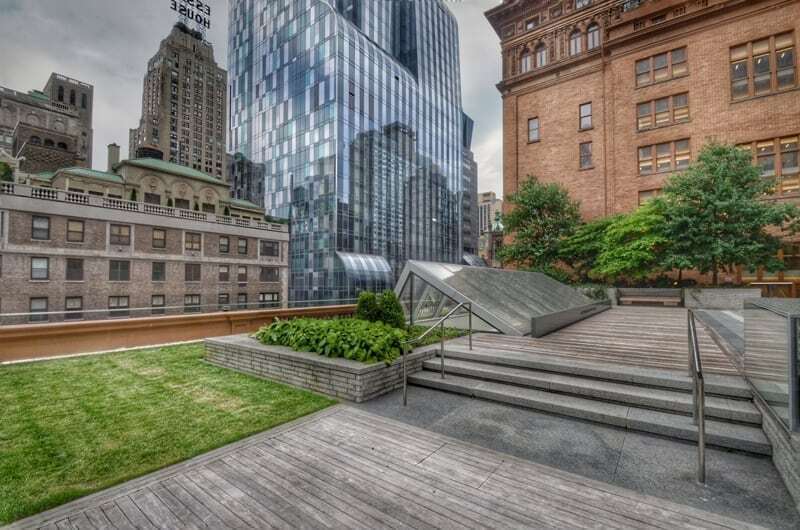 Urban landscapes are adding a new meaning to the word green. More and more businesses recognize the inherent advantage of embracing sustainability. Their courtyards, rooftops, and landscapes are being transformed into eco-friendly paradises. Water conservation is at the heart of this gardening style. Businesses are using drought-resistant plants, water-saving irrigation techniques, and rainwater collectors to lower the cost of their outdoor space upkeep. Rooftops are being adorned with gardens or just a green layer of succulents that help absorb some of the city’s pollution and minimize smog. 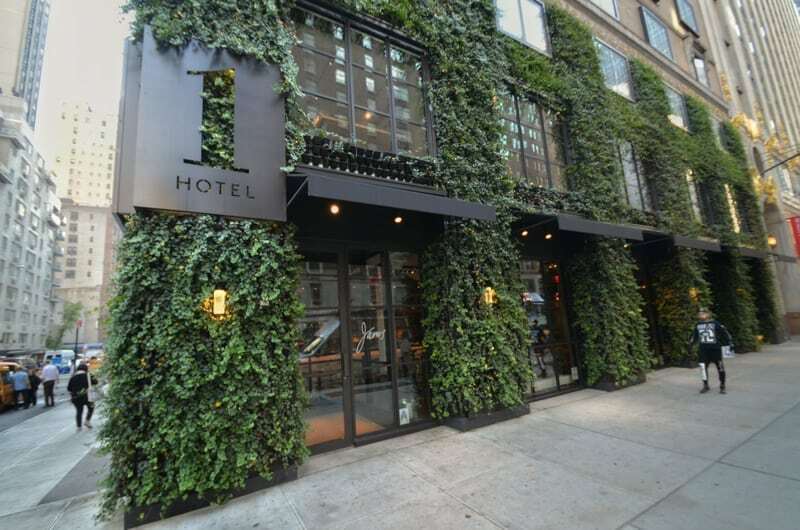 Green walls use gravity to naturally let water drip down from the top plants down to the bottom. Social media is influencing all sectors of business and their outdoor spaces are no different. Inspiring images of rooftop gardens, courtyards and patios help property developers and managers perceive possibilities in even the smallest spaces. Never have green walls, container gardens and rooftop gardens been considered so cool. Not only do they help increase productivity and make buildings more attractive, they help the environment and increase property value. All kinds of industries are seeing the advantage of providing spaces for employees and customers to enjoy outside. Tables flanked by gardens and trees are becoming common areas for working, socializing and eating. The multi-housing industry is transforming simple lawns into multifunctional spaces where residents can socialize. 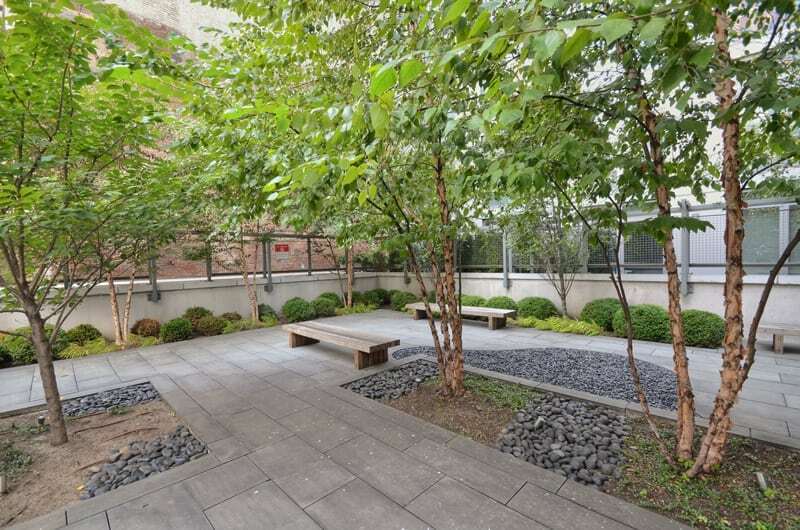 These spaces incorporate outdoor seating with sound systems, wifi, and outdoor TVs. Outdoor walking and bicycle paths are becoming commonplace. More residents, consumers, and employees enjoy the perks of a blended urban and eco-friendly lifestyle. 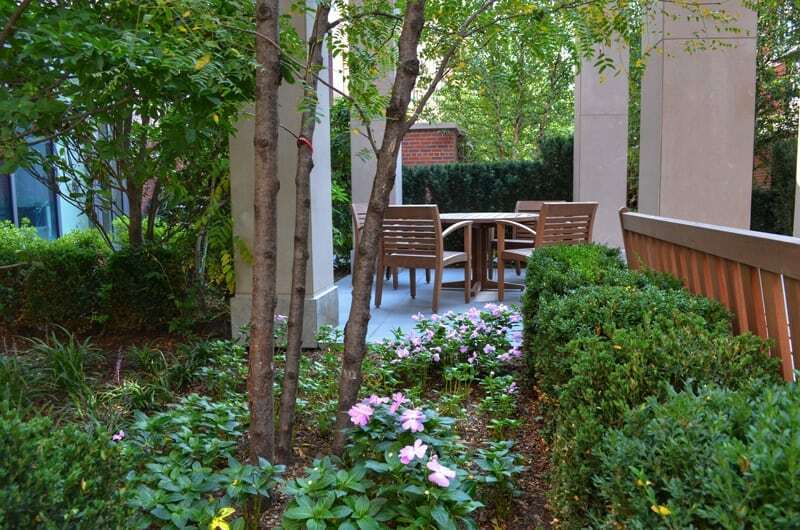 Traditionally, commercial outdoor spaces and landscapes were predominantly green and a little bland. As these spaces become more popular and transition into multifunctional gathering areas, landscapers are adding pops of color to add depth and appeal. Splashes of colorful flowers, tropical plants, and dark exotic grasses are all being mixed with foliage to create a unique and distinctive design. In the spirit of plant’s inherently relaxing qualities, commercial spaces are taking inspiration from Japanese garden elements. Ponds, clean-lines, container gardens, minimalist and elegant plant structures are being embraced. This creates a multi-sensory and tranquil environment for business and pleasure. Hardscaping with plants to create a room-like feel makes for a quiet, zen-like atmosphere that reduces stress and inspires. 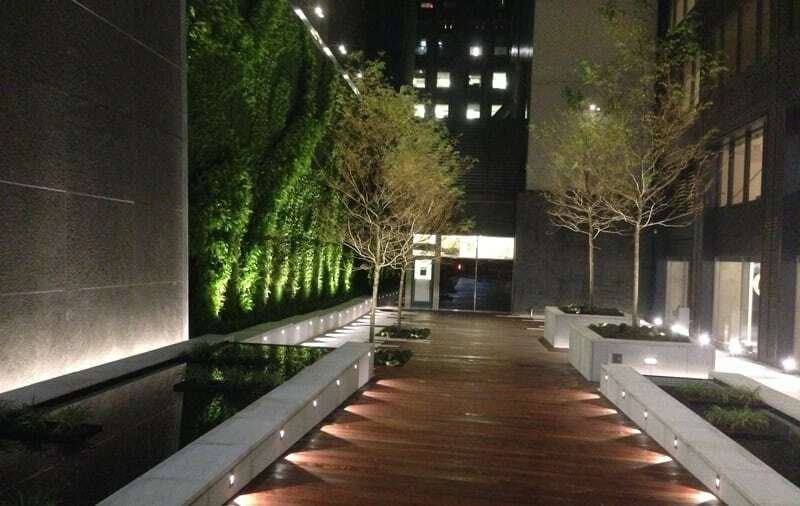 Not only are these urban commercial landscapes aesthetically pleasing, they provide calming and productive environments while increasing property value. Never has there been so many incentives and inspiring ways to invest in creative urban outdoor spaces. 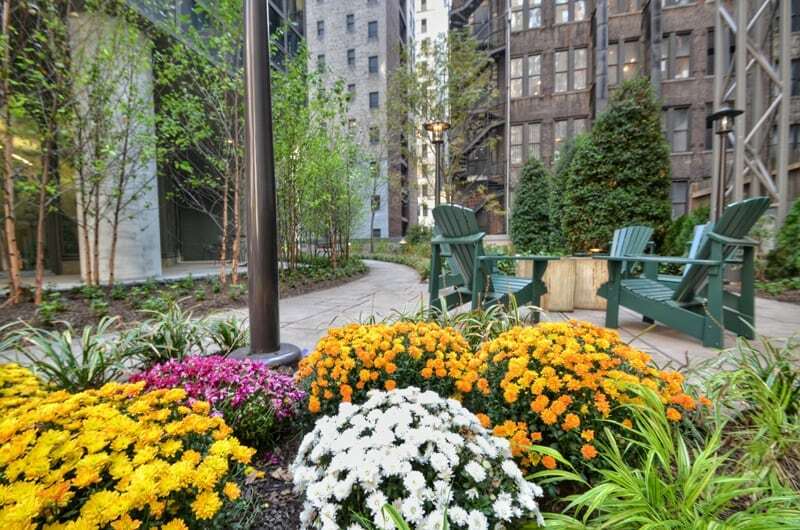 Contact us at Sponzilli Landscape Group for more information about urban landscape design trends and how they can improve your business.